The Foot Clan have resurfaced long after the death of the Shredder and launch a deadly new assault on a highly respected Chinese community leader by summoning a mystic demon that not even they seem to have control over. The only one who can stop it? Michelangelo (or so he hopes)! 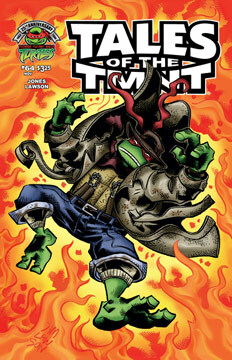 Told entirely from the point of view of everyone’s favorite turtle, “The Burning Man” finally brings TMNT legend Jim Lawson and acclaimed new writer Tristan Jones together for a very unusual tale! Oh, and that last page is a doozy!